Innovation is a key driver of sustainable development and economic growth, and for meeting the Millennium Development Goals, as re-affirmed by the 2013 Annual Ministerial Review of the United Nations Economic and Social Council. The global financial crisis of 2008-2009, the effects of which are still being felt in many countries, has only reinforced the need for innovation as a way of recovering lost ground and of making economies more resilient. These Compendia are part of a series collecting the policy recommendations and good practices developed under the auspices of the UNECE Committee on Economic Cooperation and Integration. They are developed through an extensive multi-stakeholder policy dialogue within our international expert networks. The Compendia are intended to disseminate this work to a broader audience. 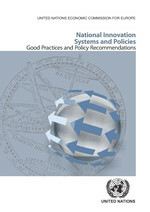 This volume discusses how to build up a coherent national innovation system through coordinated policy support for key innovation constituencies and the intermediaries which support them. Download this publication in pdf: English or click on the image. 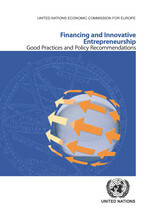 This volume focuses on policies which nurture the specialized financial intermediaries needed to provide early-stage financing for entrepreneurs and fledgling innovative companies, as well as on entrepreneurship support more generally. This volume discusses selected aspects of the role of intellectual property in the innovation process.